Turn Your Feast Focus From Food To Fun! 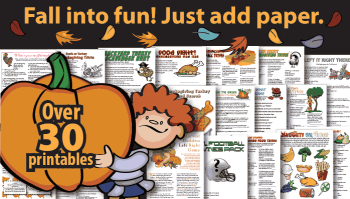 These fun Thanksgiving ideas come from our own Thanksgiving celebrations. For years Thanksgiving was celebrated at Grandma and Grandpa’s house! However, as the kids got older and the annual “Thanksgiving High School Football Game” hopped on our schedule, the tradition changed. Our house became the Thanksgiving gathering spot. As you may have gathered from scanning this site, I am not a good cook, but I do know how to have fun! Our Thanksgiving celebrations have been re-directed from the nuances of complicated recipes to traditional fare and lots of fun and games. So scroll down and keep going..this is a long page as it includes all of our favorite family Thanksgiving traditions! Decorate your home, your Thanksgiving table and keep the kids busy while the turkey is cooking and the pies are baking with these fun Thanksgiving ideas! Thanksgiving Table Favors you can make yourself! Cutest Thanksgiving craft for kids.. Turn a roll of toilet paper into your Thanksgiving table centerpiece! Thanksgiving Dinner Table Favors That Recall A Year To Give Thanks For! Get out of the recliner, off the couch, out of the kitchen and shut off the TV.. choose one of these great Thanksgiving games and activities for after dinner fun! These are all fun Thanksgiving ideas with lots of laughter and a friendly dose of family competition! Organize a fun family game of Turkey Toss.. an outdoor activity to play when the turkey is cooking! A Great Family Thanksgiving Activity..Kick off the holiday shopping season. Play "Hold or Swap"
Is Grandma cooking Thanksgiving or coming to your house to help you cook? Or perhaps you won't be together until Christmas? No matter, give thanks for the special and oh so fabulous Grandmothers in your life with this adorable box sign. Order here! From turkey pops, to turkey fruit display and cookies and candy.. all festive and easy alternatives to pumpkin pie! If you love Margarita Pizza, you'll love this Margarita Spaghetti Squash! Great ideas for gifts, decorations, Christmas cookies and games .. Click here to visit our Holiday Fun section!